Pumpkin Spice Buttermilk Cake with a warm Cinnamon Cream Cheese icing is perfect for Fall entertaining, Holidays or any occasion. How come when a cake is baked in a bundt pan that it just says I’m fancy? Well, this Pumpkin Spice Buttermilk Cake tastes fancy but is quick and easy to put together. The Cinnamon Cream Cheese icing is a perfect match to this warmly spiced pumpkin cake. With the weather turning cooler and the holidays running through my head I naturally drift to pumpkin. Since I’m usually in charge of the dessert at our families Thanksgiving get together, I went searching for a pumpkin cake. When my eyes landed on this Pumpkin Spice Buttermilk Cake by Cozy Cakes Cottage. A quick and easy Pumpkin Spice Buttermilk cake that is moist and delicious. This cake looks like it is ready for a celebration, but is perfect for any occasion. This cake is perfect for the holidays or anytime! I hope you will enjoy it as much as we did! Once the weather cools, do you get the itch to get back into the kitchen? What are you craving? Another amazing Pumpkin dessert is my Pumpkin Cheesecake Pie or Pumpkin Pecan Cheesecake! Thank you Antonia! I love pumpkin spice too! The frosting is what got my attention Julie – cinnamon cream cheese! Perfect dessert for Fall. Thank you Judi! It may be repeated at Thanksgiving too! This is why I love this time of year so much! Pumpkin desserts are my favorite treats. That cream cheese glaze is perfect on this cake! Thank you Sandra! I think it’s our trade off for giving up summer? Julie — this is one gorgeous cake!! I can’t wait to bake it ASAP!! Thank you so much Dini! I just love these fall flavors too and especially when my sweet tooth is involved! How fun and pretty is this! I love a bundy cake. Something about the way the hole in the center pools all the glaze in a swimming pool of yumminess! I can’t wait to get a new bundt pan to make this and maybe a mini bundt pan too! Thank you Jennifer! I don’t use my bundt pan that much, but you’re right that I just love how the center collects all of the yummy glazes and frosting! Love buttermilk in baking and this cake is perfect to welcome fall. Looks so moist. Gorgeous photos Julie! Thank you Johanne! I really appreciate you hosting FF this week too! I just bought buttermilk for another recipe and the store only had a HUGE carton. I am not a fan of pouring myself a tall glass of buttermilk so this cake is a perfect rescue! Thank you! Your cake looks so moist and delicious- can’t wait to get baking! Thank you Michelle! I’ve never been one to drink buttermilk either but sure love what it does to a cake. Thank you Angela! I guess pumpkin is our consolation for giving up summer right? Ok, Miss Fancypants – or Fancypan!! lol!! Seriously you are so right about Bundts. Why the always seem to serve so many is beyond me, they’re like magic. Beautiful post and you can see just how moist it is! Thank you Mollie! I am usually a pie person over a cake, but this is one delicious cake. Thank you so much for hosting FF this week! Ha! Thank you so much, Julianna! Please let me know what you think! What a gorgeous fall cake! I want a piece right now! Thank you, Colleen! I wish we had virtual sharing. I’d love to share! I can’t believe it’s Fall already because it doesn’t feel like it here in Ontario, but I’m on the same page as you. I’m loving the all the warm and cozy spices that Fall brings. Your pumpkin Spice cake is perfect to welcome in the new season – yum! Thank you Lily! It was in the 90’s this week and even though I don’t like the cold, I’m done with those temps! We were just in Colorado and their leaves are starting to change. They’re ahead of us. Have a wonderful weekend! Thank you Heather! We loved it! I’m also bummed about summer being over – I never feel like I ate enough peaches to properly celebrate the season! But I love fall so I’m excited about that…especially because it brings with it treats like these! This cake looks delicious, and your styling is gorgeous as well! Thank you Mara! I’m with you, I just hate the produce kicking up it’s heels too. The peaches right now are amazing but I thin that’s only going to last a short time. Enjoy your weekend! This cake is gorgeous and I’m sure it tastes amazing! Thank you Lisa! There has to be something redeeming about the thought of summer ending and that must be pumpkin? This reminds me so much of the US. Fall is special there. You are so right Nadia! It’s the only consolation for losing summer I think. Thank you Justine! Happy Friday! I am in love with this cake Julie! Spicy and aromatic..must smell like heaven..percent t for fall! Thank you Sonal! I love the pumpkin and spice flavors this time of year! This looks delicious! So perfect for fall! It’d be great at a Thanksgiving day spread. Thank you Debi! My eyes are already thinking Holidays too! I welcome fall and all the flavors which you have captured in this beautiful cake recipe! Pass a plate with a big ole hunk! Thank you Patty! I sure wish there was virtual sharing! Of course I’d be a whole lot chunkier! That is one fabulous looking cake! Would you believe that I don’t own a bundt pan! Clearly I need to change that! Thank you, Michelle! I had a pan that was a pain in my backside because everything stuck to it. My mother-in-law gave me an old one and it works like a charm. Ahhh the sounds and scents of Autumn. You’ve captured it beautifully in this pumpkin spice cake, the buttermilk had to have added extra moistness to the cake. Lovely warm images and ever so tempting Julie. Thank you Loretta! I am usually a pie person over cake but I really like the spice flavors in cake and other bakery treats. Yummy! I love pumpkin everything 🙂 Love buttermilk in spiced cakes and sweet treats. Thank you Sarah! I’m with you and love these fall flavors. Bundt cakes always make me feel fancy!! 😀 This is the perfect cake for the changing season – love all the spices you added + the addition of buttermilk. This will have to go on my list of recipes to make this fall. Thank you so much Jasmine! It always amazes me how our appetites and cravings change with the seasons and the weather. I love pumpkin and your cake looks so fancy, yummy and perfect for fall! Hahaha! I like your style Patti! You are so right, bundt cakes just scream fancy. Love this cake, it looks moist and delicious. I love the warm spicing that comes with Fall and winter baking and of course pumpkin and apples which go so well with them. Thank you so much, Peter! I really appreciate your kind comments. This cake is a keeper, and I’m with you loving pumpkin spice season! Can I just come live next door? 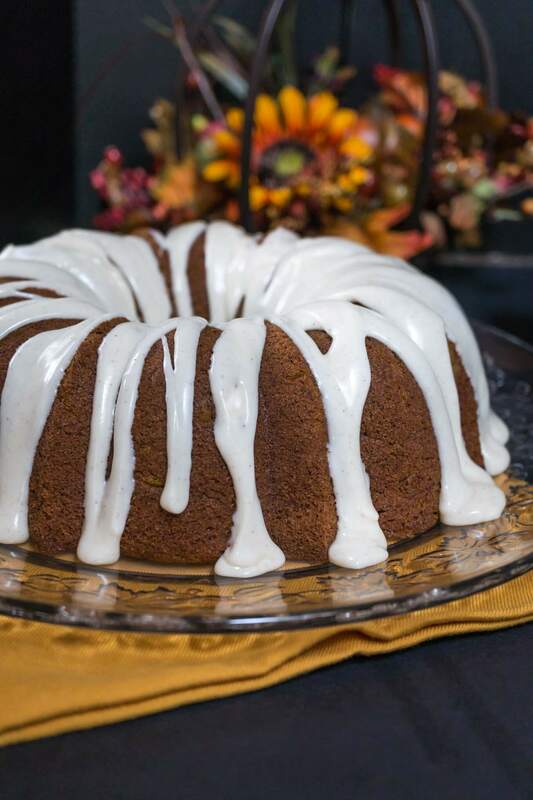 I love pumpkin and your bundt cake looks so moist and delicious! AND cream cheese icing? Oh man. Thank you Jess! I hope you get a little fall in beautiful California! Thank you Ana! Isn’t it funny how our cravings change with the seasons? Does yours even though it’s warm there most the time? Enjoy your evening my friend!